British chemicals firm Johnson Matthey has identified a site to build a catalyst plant in Brazil, which will produce catalysts for hydrogen production. The plant, which will be a part of Johnson Matthey Process Technologies, is planned to begin operations by the end of this year. It will initially have a workforce of around 15. It will complement the company’s existing nine catalyst manufacturing sites that it operates in six countries. The project is part of the company’s ongoing hydrogen plant catalysis development in partnership with Petrobras. According to Johnson Matthey, refineries worldwide are increasing ‘on purpose’ hydrogen capacities due to tough fuel specification, processing of heavier and sourer crudes, and increasing demand for lighter crude oil products and chemical intermediates. "This investment demonstrates our long-term commitment to manufacturing in Brazil." Johnson Matthey divisional director Geoff Otterman said: "For a long time we have recognised the strategic importance of Brazil and South America. "This investment demonstrates our long-term commitment to manufacturing in Brazil. "Beyond this, it is our intention to expand our manufacturing capability here to include products such as catalysts and adsorbents for gasto liquids and gas purification." Johnson Matthey is engaged in clean-air, clean-energy and low-carbon technologies. It employs around 12,000 people across its operations in more than 30 countries. 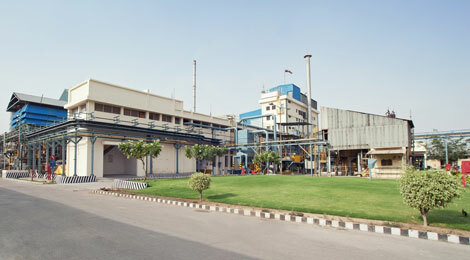 Image: Johnson Matthey’s catalyst manufacturing plant at Panki, India. Photo: courtesy of Johnson Matthey.